The latest version of this topic can be found at Lambda Expressions in C++. In C++11, a lambda expression—often called a lambda—is a convenient way of defining an anonymous function object right at the location where it is invoked or passed as an argument to a function. Typically lambdas are used to encapsulate a few lines of code that are passed to algorithms or asynchronous methods. This article defines what lambdas are, compares them to other programming techniques, describes their advantages, and provides a basic example. A lambda can introduce new variables in its body (in C++14), and it can also access—or capture--variables from the surrounding scope. A lambda begins with the capture clause (lambda-introducer in the Standard syntax), which specifies which variables are captured, and whether the capture is by value or by reference. Variables that have the ampersand (&) prefix are accessed by reference and variables that do not have it are accessed by value. An empty capture clause, [ ], indicates that the body of the lambda expression accesses no variables in the enclosing scope. Only variables that are mentioned in the lambda are captured when a capture-default is used. If a capture clause includes a capture-default``&, then no identifier in a capture of that capture clause can have the form & identifier. Likewise, if the capture clause includes a capture-default``=, then no capture of that capture clause can have the form = identifier. An identifier or this cannot appear more than once in a capture clause. The following code snippet illustrates some examples. To use lambda expressions in the body of a class method, pass the this pointer to the capture clause to provide access to the methods and data members of the enclosing class. For an example that shows how to use lambda expressions with class methods, see "Example: Using a Lambda Expression in a Method" in Examples of Lambda Expressions. Reference captures reflect updates to variables outside, but value captures do not. Reference captures introduce a lifetime dependency, but value captures have no lifetime dependencies. This is especially important when the lambda runs asynchronously. If you capture a local by reference in an async lambda, that local will very possibly be gone by the time the lambda runs, resulting in an access violation at run time. In C++14, you can introduce and initialize new variables in the capture clause, without the need to have those variables exist in the lambda function’s enclosing scope. The initialization can be expressed as any arbitrary expression; the type of the new variable is deduced from the type produced by the expression. One benefit of this feature is that in C++14 you can capture move-only variables (such as std::unique_ptr) from the surrounding scope and use them in a lambda. In addition to capturing variables, a lambda can accept input parameters. A parameter list (lambda declarator in the Standard syntax) is optional and in most aspects resembles the parameter list for a function. In C++ 14, if the parameter type is generic, you can use the auto keyword as the type specifier. This tells the compiler to create the function call operator as a template. Each instance of auto in a parameter list is equivalent to a distinct type parameter. A lambda expression can take another lambda expression as its argument. For more information, see "Higher-Order Lambda Expressions" in the topic Examples of Lambda Expressions. Because a parameter list is optional, you can omit the empty parentheses if you do not pass arguments to the lambda expression and its lambda-declarator: does not contain exception-specification, trailing-return-type, or mutable. Typically, a lambda's function call operator is const-by-value, but use of the mutable keyword cancels this out. It does not produce mutable data members. The mutable specification enables the body of a lambda expression to modify variables that are captured by value. Some of the examples later in this article show how to use mutable. For more information, see Exception Specifications (throw). The return type of a lambda expression is automatically deduced. You don't have to use the auto keyword unless you specify a trailing-return-type. The trailing-return-type resembles the return-type part of an ordinary method or function. However, the return type must follow the parameter list, and you must include the trailing-return-type keyword -> before the return type. You can omit the return-type part of a lambda expression if the lambda body contains just one return statement or the expression does not return a value. If the lambda body contains one return statement, the compiler deduces the return type from the type of the return expression. Otherwise, the compiler deduces the return type to be void. Consider the following example code snippets that illustrate this principle. A lambda expression can produce another lambda expression as its return value. For more information, see "Higher-Order Lambda Expressions" in Examples of Lambda Expressions. Captured variables from the enclosing scope, as described previously. Because the variable n is captured by value, its value remains 0 after the call to the lambda expression. 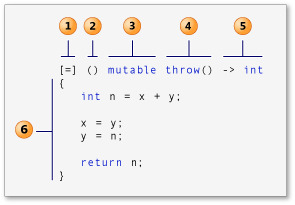 The mutable specification allows n to be modified within the lambda. Although a lambda expression can only capture variables that have automatic storage duration, you can use variables that have static storage duration in the body of a lambda expression. The following example uses the generate function and a lambda expression to assign a value to each element in a vector object. The lambda expression modifies the static variable to generate the value of the next element. // A local static variable. For more information, see generate. The following code example uses the function from the previous example, and adds an example of a lambda expression that uses the STL algorithm generate_n. This lambda expression assigns an element of a vector object to the sum of the previous two elements. The mutable keyword is used so that the body of the lambda expression can modify its copies of the external variables x and y, which the lambda expression captures by value. Because the lambda expression captures the original variables x and y by value, their values remain 1 after the lambda executes. // The number of elements in the vector. // Create a vector object with each element set to 1. // These variables hold the previous two elements of the vector. // Update previous two values. // Print the local variables x and y. // they are captured by value. For more information, see generate_n. Lambdas are not supported in the following common language runtime (CLR) managed entities: ref class, ref struct, value class, or value struct. To determine whether a modifier is supported by lambdas, see the article about it in the Microsoft-Specific Modifiers section of the documentation. Like all other classes, lambdas don't get automatically generated move constructors and move assignment operators. For more information about support for rvalue reference behaviors, see the "Rvalue References" section in Support For C++11/14/17 Features (Modern C++). The optional attribute-specifier-seq is not supported in this version. Stateless lambdas, which are omni-convertible to function pointers that use arbitrary calling conventions.